Successfully Added 4 Channel DVR Kit "Watch-Tower" - 7 Inch LCD Screen, 2x Outdoor Cameras, 2x Indoor Cameras, H.264 to your Shopping Cart. 4 Channel DVR Kit features a 7 Inch LCD Screen to watch the feeds directly from the two Outdoor Cameras and two Indoor Cameras to boost convenience as well as safety. 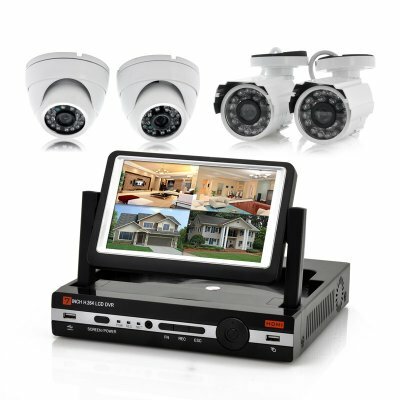 A great way to get started in increasing the security of your property is with this security surveillance set that comes with a 4 channel DVR with a 7 inch monitor and four cameras for instantly connection and monitoring. 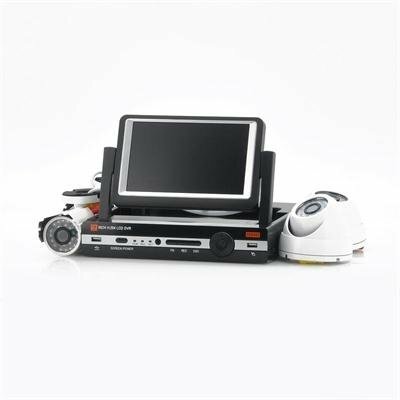 The 7 inch LCD monitor folds out from the top of the DVR to protect from damage when not in use but it is being used it can display up to four different feeds simultaneously and it can be controlled with the accompanying remote controller. Using H.264 video compression, the “Watch-Tower” records footage at a reduced bit rate nonetheless it still maintains a high quality, which results in good video footage that takes up less storage space. The standard video compression is H.264 and also it is one of the most commonly used formats for the recording, compression, and distribution of high definition video. As this DVR is 4 channel, there are 2 cameras designed for indoor use and 2 cameras for outdoor use as part of the package. The cameras provide a stunning 600TVL resulting in great footage plus the 24 IR LEDs that provide a 15 meter distant view make it ideally for capturing activity whether it is day or night. Additionally, the “Watch-Tower” DVR has a LAN port providing you the opportunity to connect it to your LAN network or even the internet for remote mobile viewing via your mobile phone. To save and store the footage, you’ll be able to insert a SATA hard drive of up to 2TB into the “Watch Tower” to expand the storage space. Increase and improve the security at your property with this 4 Channel DVR with a 7 inch adjustable screen. Now in stock, the “Watch-Tower” can be shipped out within one working day and comes with a 12 months warranty. Brought to you by the leader in wholesale IP enabled DVR Systems.